Final Board Design, designed in photoshop, printed on foamcore with gloss finish. 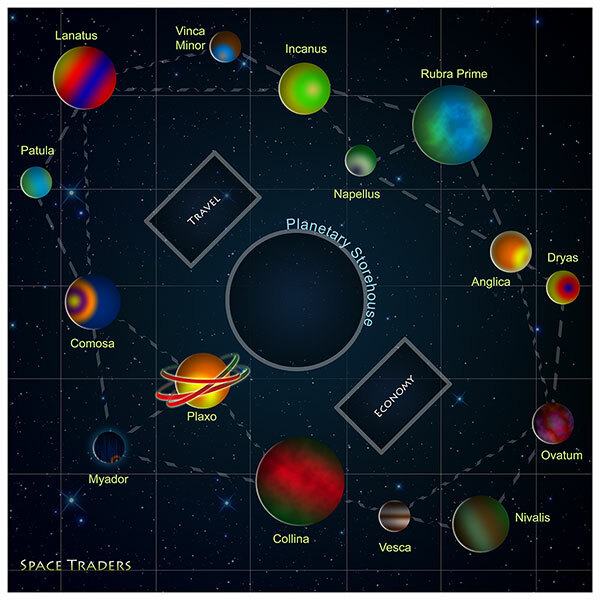 Planet and board art designed by myself. player is presented with interesting choices as well as being at the mercy of chance. your legs off and eats them. chance of encountering good or ill fortune during space travel.
? 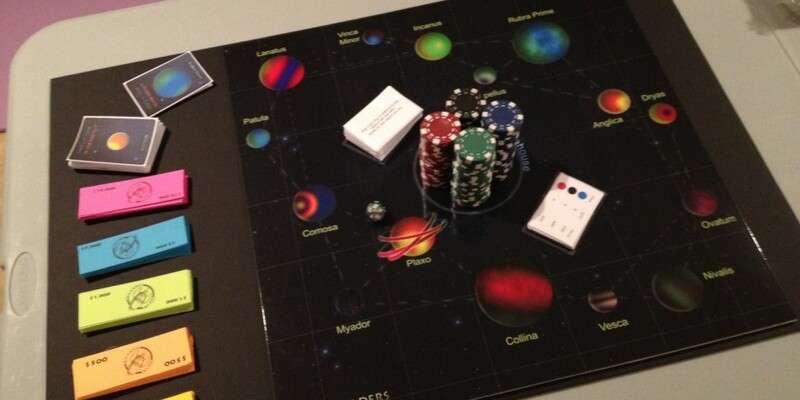 Each player must select a ship and is presented with 5000 Space bucks.
? 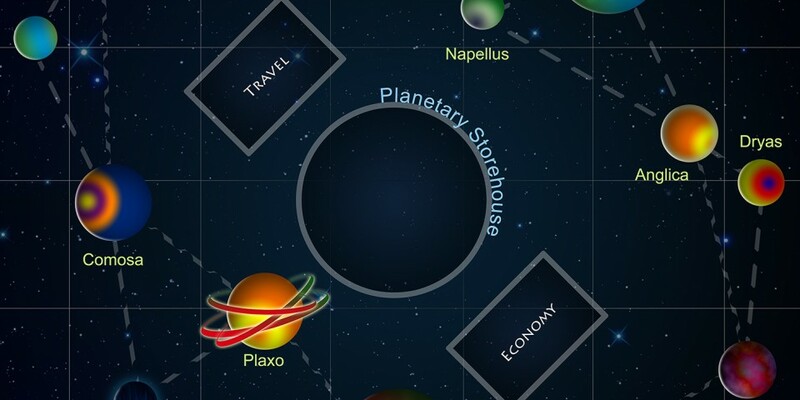 Each player begins on the planet closest to him, their Home Planet.
? Roll the highest number on the die to determine who goes first.
? 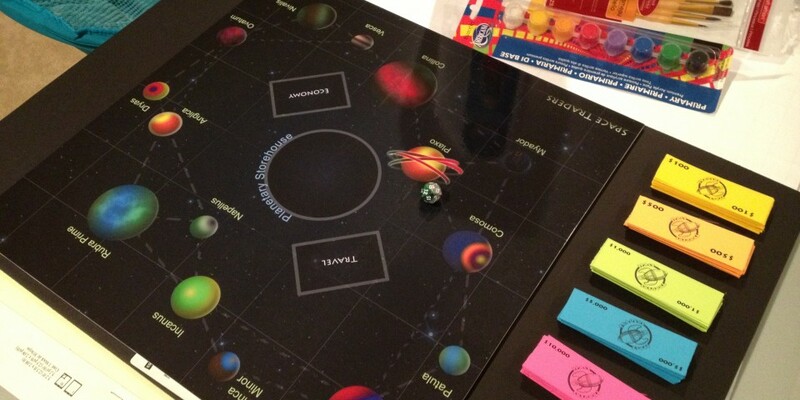 The first player begins with a Travel Phase in order to move around the board, from Planet to Planet. the travel lines on the board) and choosing a Travel Card, which will provide a consequence of travel.
? Follow the instructions on the Travel Card. Example: You encounter Space Bandits on route. Pay 1000 OR Attack by rolling. Roll >= 10, collect 1000. Roll < 10 pay 4000.
select one and place the other two back in the deck. claim only one of its perks, of two.
? The player to the right of the first player can now take their turn following the same steps. on all the planets and their races as well as additional ‘plots’ for travel cards. Final Board and Some playtime with coworkers at the office. thought, iteration, and feedback from classmates I was able to come up with a much simlified solutions. allowed for there to be a tangible representation of wealth and simplified the management of ones own inventory.
? Trading with other players in an auction house manor.
? Planets have greater diversity of perks.
? Ships have unique properties like cargo space, weapons, science facilities which offer players perks. setting and gameplay will draw in an a wide audience. After all who doesn’t want to be Han Solo. valuable experience in future game design projects. Concept art for card art. Images on cards were appropriated from the web. Sketches of Travel card and board art.